There’s an online pre-registration that works perfectly fine. General admission is $8 and early bird is $15 with a small $3 dollar fee if you buy it online ahead of the event. Kiddies under 12 get in for $3, which makes for a great family event. More than fair price considering the cost of admission is for 2 days. One bummer however is that the cost of parking is $8! A little steep in my opinion, but that’s outside the show’s control. At the very least, it’s just across the street from the show and easily accessible. This is my 2nd time attending it. It’s in San Jose, CA at the Santa Clara County Fairgrounds. The last one I went to in November was just 1 day. Apparently there are 3 shows a year, 2 of them being 2 day shows. I went for the online early bird special and was able to skip the line completely and get in early. You can still buy the early bird ticket on the day of the event but you have to wait in line. And the line is LONG, unbelievably so. If you’re going to pay the extra money to go early bird, you don’t want to spend an hour waiting in line for a ticket! 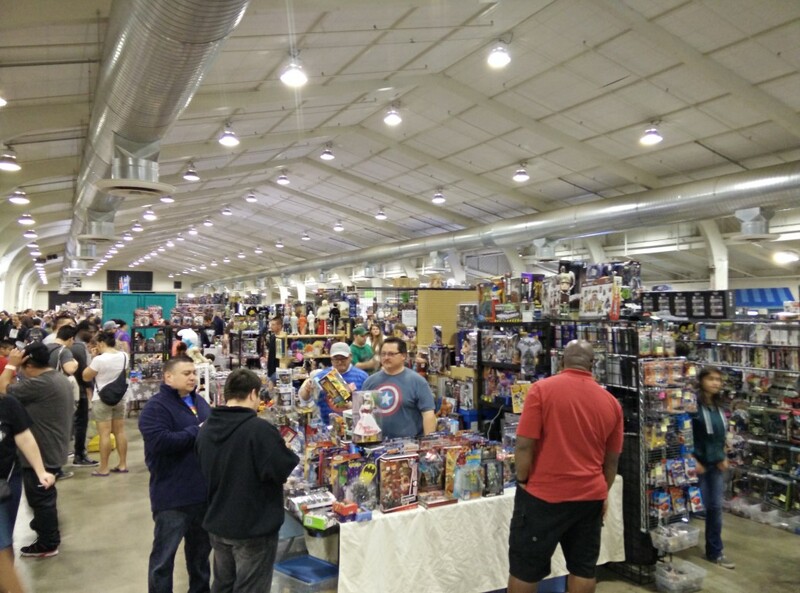 The title of the show is San Jose Super Toy & Comic and Collectible Show and as you walk in, your senses are immediately overwhelmed by the sheer amount of collectibles and toys that you can buy. If you’re a fan of vintage toys, this is your show. I would say more than 50% of the tables are toys, 25% comics and the other 25% a mix of art, books and miscellaneous collectibles. For comics, the only thing I’m personally interested in, there are lesser options. I usually like to do a quick browse of the entire area. I’m looking specifically for faces I’ve never seen before. They typically have a lot of good stuff for good prices. I’m sure this is the same for toys. I don’t buy too many toys but I would say for toy fans, it should be a treat. I do however love looking at all the cool vintage toys, and it’s challenging not to buy some. But alas, I have no where to put them. Comics it will be for me. There’s one eating area in the back of the main building. 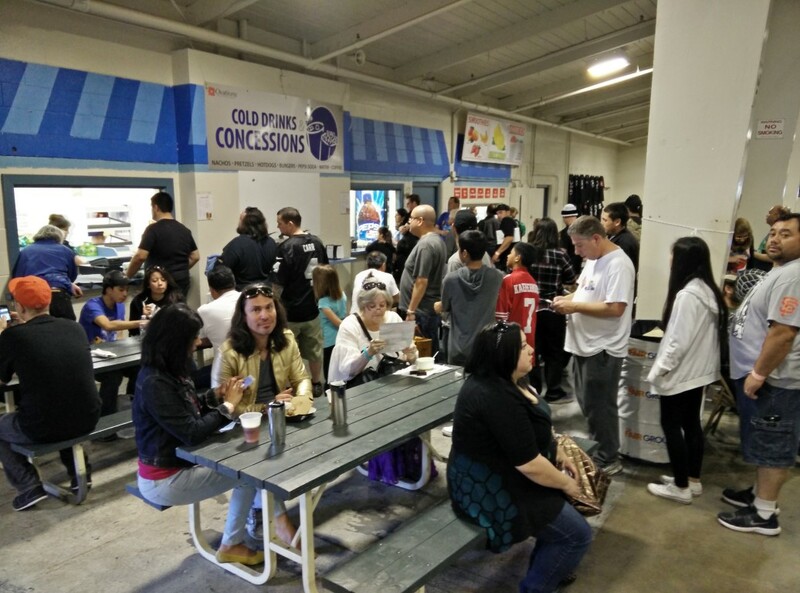 They sell normal con food – french fries, hot dogs, burgers. Meh. And expensive, relatively. I opted to leave the premise and catch some grub at the nearby The Plant shopping center where they have many more options. Seating in general, is very limited. Mostly near the eating area and just outside the doors near the entrance. This is the norm for most cons and shows. A vendor table is $155 each or $179 for a wall or end of row tables. It’s not super cheap but you get 2 days. You get 8 foot tables and what seems like plenty of space for vendor. 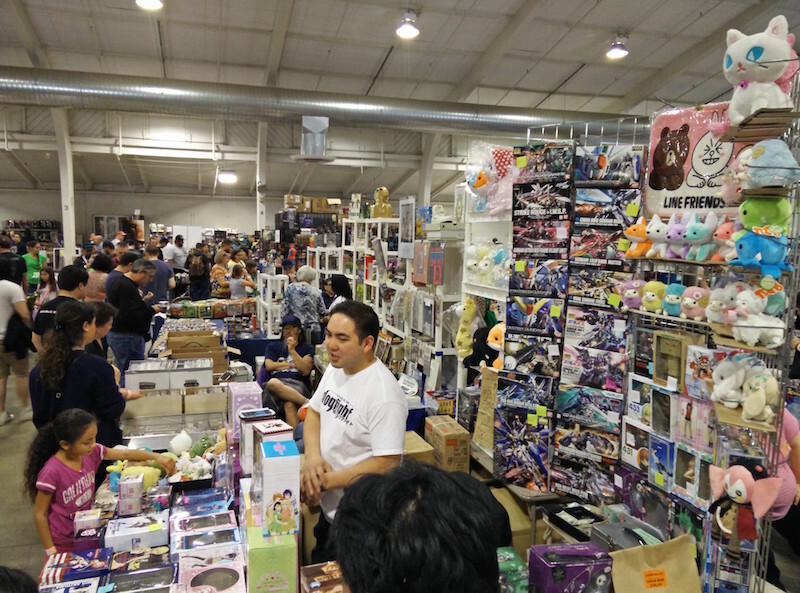 I don’t know the exact measurements, but after working a table a couple weeks ago for Sac Con, I can definitely say that this show has a lot more space per table. Though I suppose YMMV depending on whether you get an end row or wall section. This is a perfect show for vendors selling their personal collectibles from the local area. It’s affordable and you get a lot of foot traffic over 2 days. I’ve attended a LOT of shows the last 8 months. And when you go to as many shows as I do, you tend to recognize vendors and they in turn recognize you. At the same time, you also recognize which vendors have cheap, market-rate or bat$#!% crazy prices. I don’t mind the bat$#!% crazy prices – vendors can price their items whatever they want. But what bugs me are vendors that have bat$#!% crazy prices and at the same time incredibly sketchy and mean. They’ll not only overprice books but also over grade them. And they’ll try to sell these items vigorously like a used car salesman. I honestly don’t know how they stay in business moving so few products. Would someone really pay $325 for a FINE The New Mutants #98??? Sometimes I still think that some of these vendors are also stuck in 1995. We have eBay on our phones to check current market prices in seconds. I’ll skip these vendors the rest of the day and eventually learn to skip them completely in future shows if they continue their practices. Thankfully, these are far and few between and there are plenty of fair and honest dealers out there, you just need to do some due diligence and seek them out. Don’t get fooled – we have the technology to avoid being scammed and we even wrote The Complete Guide to Buying Comics at a Con. What I love about this show and what makes it one of my favorites is how affordable and accessible it is to vendors who don’t sell comics and toys full time. They tend to come out to these local shows to sell their personal collections and downsize. The best part is that these vendors care less about making a profit, and would rather sell their items to real fans and collectors. This is a big divergence with other ‘big’ past and upcoming cons where vendors shell out tons of money for a table so they have to mark everything up to make a profit. It’s in my opinion that small shows like this is where the best deals are had. Don’t get me wrong, the big players still come out from all over California, but you’re more likely to see several tables with faces you’ve never seen before and will probably never see again selling personal collectibles. I also find these people more friendly as to them, it’s not a business. My only hope for this show is that it never adds a lick of CSS into their website and stays true to their vintage spirit. If they do, I’ll be a lifelong attendee. 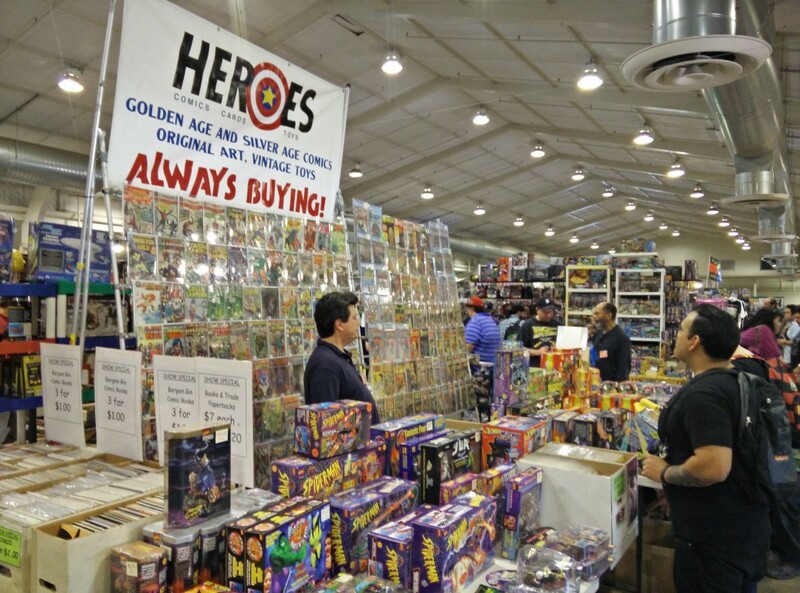 The next San Jose Super Toy Show is on August 29 and 30th, 2015. Don’t miss it! Checkout the rest of the pictures below.